You see your friends’ photos on the Internet with them proudly displaying medals around their necks from whatever race they just ran. Their ecstatic glow and flushed complexion are things that you find yourself wanting, but you think to yourself, “I wish I could do that.” Why can’t you? 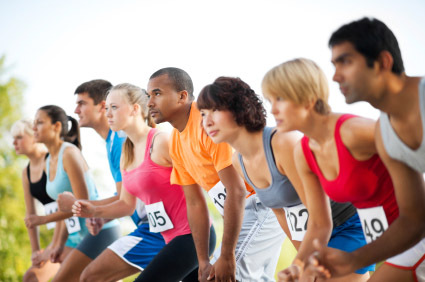 Everyone starts somewhere, and rocking a 5k race is a great place to begin! Some simple steps and pointers can help you go from zero to 5k in no time! Recruit a friend. It is no secret that people tend to expect more of themselves when there is someone else who expects the same behavior as well. Running with another person makes you less likely to skip a day and more likely to increase your motivation. One tip that is more and more common amongst runners is posting their progress in training for a goal on social media sites. It can have a similar effect as running with a friend, as long as you are honest about your progress. Set a realistic goal. As motivated as you may be at first, choosing to run a half marathon before you can even run around the block is a bad decision. Set goals that are attainable. This way, you’re setting yourself up for success, motivated by your goal instead of being intimidated by it. Don’t be intimidated by regimented training plans. You may find yourself exploring different training plans that are very structured and regimented. Although this may help, it may also make you stray from your plan. We have good days and bad days. If on a particular day, you have a difficult time following the plan, don’t beat yourself up over it. Create a more realistic plan and take things slowly. Otherwise you will be disappointed in yourself and avoid the activity all together since it creates a sense of self-doubt. Warm up and stretch before each run. Cool down after. Runners need to be flexible in order to avoid injury. This means stretching before and after a run, as well as warming up with a walk for at least 5 minutes. Make it fun. You should look forward to your runs, not dread them! Some awesome running music like our mixes can help push you through when you need motivation. And if you’re having fun, you’re more likely to want to do it on a regular basis. Eventually it will turn into a habit – a fun habit at that. Eat! Don’t just eat, but eat right. Approximately three hours before the 5k, eat something that will not sit like a brick in your stomach. Good energy sources are bagels, bananas, and peanut butter. Use the same music you used in training. Music has inherent mental and emotional cues to it. Listening to the same running music you listened to while training will help you feel confident on race day. Find your mark! For your first 5k, you might be excited to start right at the front of the line. But you’ll feel less intimidated if you stay away from the most congested area. Try the middle or back of the pack. Save your energy. You’ll need to find a pace that works for you, not just for the people around you. Listen to your body. 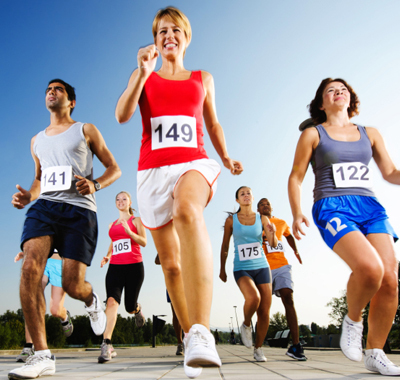 Running is sometimes accompanied by leg cramps and fatigue. Don’t be ashamed to walk when you need a break. There will be other 5k’s through which you can run nonstop. Take things one race at a time. Be proud of yourself. Even if you struggled, be proud that you made it through your first finish line. Take in the moment and bask in the greatness of of your accomplishment. Once you decide to run a 5k, running will most likely become a habit in your life. You must remember a few things. First, do not become intimidated by anyone who finishes before you. You have the right to finish the race as well. Also, when you start to doubt yourself, remember that you’re still doing better than those who aren’t doing it at all.